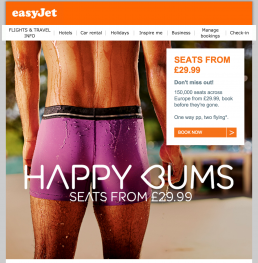 I, like many other thousands, if not millions, of people have bought EasyJet flights online. As a result I’m on their email mailing list and regularly get their latest promotional offers. I couldn’t help comparing it in my mind to another email I’d received on 2nd Jan at 2:43am which was almost identical in terms of copy and had just one main distinguishing factor – can you spot the difference? My mind started whirring and I thought this must be a controlled split test being carried out by their marketing team. Considering the other variables such as time (the time was off by 1 hour, but the idea of me having it in my inbox as soon as I awoke remained the same), email subject, email copy, etc. were identical, their marketing department (or agency) must have been investigating the difference in click throughs generated from a female bottom versus the same feature on a male! I’d love to know the actual difference in click through rate between the two creatives! 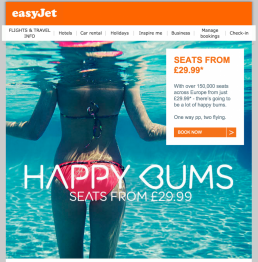 Good stuff EasyJet, keep it up!